If only cars could talk... What stories and memories they could tell. For me personally the three cars in this picture would have many stories to tell. They have all been in my life one way or another and had pivotal moments and memories attached to them. The 69 Mustang and I go way back to 1974 when it first came into my life. I actually remember seeing the car for the first time on North Louisa just south of Jefferson school. I could not believe my Dad had found this orange, jacked up, mag wheeled Mustang for me, a 15 year old motor head that had already been through the bicycle, go kart and motorcycle phases... Well, maybe not phases as I'm still interested in that stuff today, but Dad saw and drove my interest and helped me through learning about those things. The first couple years where pretty quite with the Stang, both figuratively and literally. I left it pretty stock but couldn't help "tuning" the 351 Windsor two barrel motor and painting a few things up under the hood to make it look cooler. However before I was out of high school the hot rod phase started and one pivotal moment was when I chose headers over decorative "side pipes". I really was going to put some simple side pipes on the car like was cool in the day, but picked up some headers and Cherry Bomb style header mufflers instead triggering the performance spiral that took over. In the end the car was not very streetable and a followup rebuild didn't make it much better. What was to be a rebuilding of the drivetrain turned into a 20+ year ordeal and rebuild including a new shock tower, battery tray, floor pans and more... much more. So as of today it runs, doesn't quite drive, but is making its comeback and I'm guessing feeling quite proud. I wonder what it thought as it sat outside through many hard winters and summers unable to move and missing it's heart and soul of engine and transmission. Ten plus years ago I tore it completely down to do all the major work and at least finally got it back indoors so it wasn't beat down so much by the weather. I'm pretty sure it gave up on me more than once as time dragged on and progress was slow or no progress at all for months. Other projects were getting attention such as the Turbo Coupe, SVO Mustang, the old 4x4 Ranger and Austin's project cars. Maybe it did see the slow but growing parts pile that would eventually bring it back to life and held onto hope. Maybe it wondered if that moment would ever come. 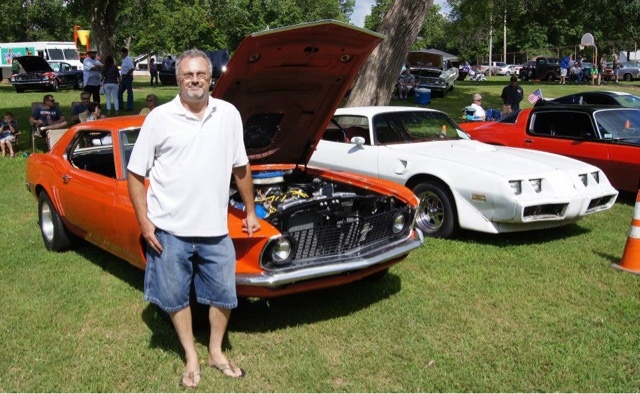 The moment did arrive during the week of June 22, 2015 and through seven straight days of getting it back together it was close enough for the old car to limp onto a trailer and make the ride to the Knights 30th annual car show. Maybe it remembered being at the 1st annual show in 1986... or maybe it's gotten old and can't remember some things like its owner does, no telling. In any manner the future is looking up so far and it had a day in the park to sit next to an old buddy, our old 1980 Trans Am that it shared the driveway with decades ago. Maybe they talked about old times as well? Speaking of the Trans Am, it was in our lives during a short but important time period. Before we sold it to Jane Wright, the Trans Am was my daily driver in the middle 80's and took Karen and I around quite a few states. It took us on early vacations and our honeymoon to the Gulf coast. It was the factory silver color back then and nearly new. Being able to sit in the car once again recently brought back many memories of those times. At one point Jimmy and Jane had to get rid of the old bird but now it's back in their hands and with old friends. In fact the car has memories of taking them on their honey moon as well so I'm sure it has many stories to tell about both our families. It too sat unused and unloved for some time before Jimmy brought it back to life and likely has its stories of abandonment out in the hot and cold. Jerrys beautiful 78 Camaro looks just like it did 30 years ago. It too continues to hold a special moment in Karen's and my life as this was the actual car that we first met in on June 29th, 1980. The car could likely tell the story better but Jerry and I were cruising around Kickapoo in his car since for one, mine was a 1967 Cougar "rescue" car that, although a fun daily driver with my old original Mustang motor in it, was nothing to really look at and Jerrys was a nearly new Camaro. Jerry saw a girl he knew, Crystal, that he wanted to talk to again and she happened to have a friend named Karen with her. Jerry and Crystal jumped in the back seat and I ended up in the front driving with Karen in the passenger seat. We both remember that quite well actually. The Camaro may have been wondering what the heck was happening but we had a good evening getting to know each other and three years to the day later Karen and I were getting married to each other in 1983. Now 35 years later, all three cars were sitting in Boy Scout Park together for the 30th Knights show. The first time likely that they were all in the same spot at the same time. I wonder what stories they were sharing with each other while we all sat around and caught up on the missing years ourselves?